Rejuvenate and soothe yourself with traditional Balinese therapeutic massage and wellness treatments. 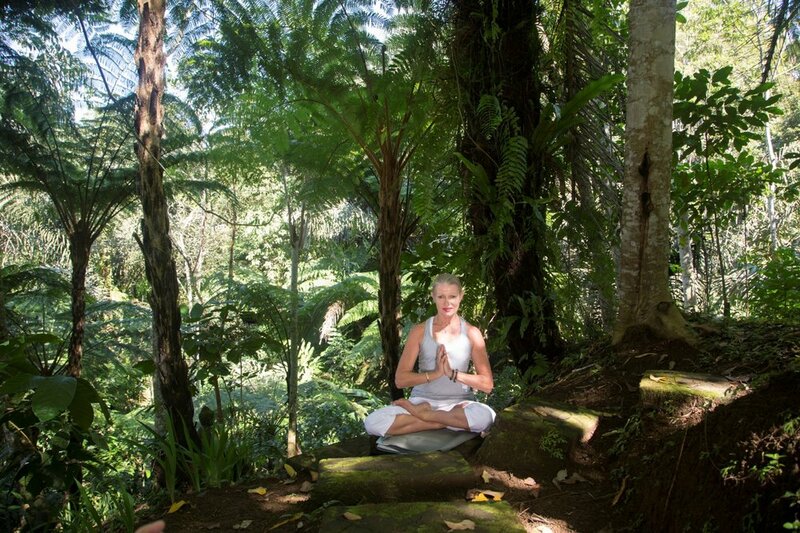 Find our Bali wellness retreat high in the Mount Batukaru rainforest . Honour your body, mind and soul with tailormade yoga and meditation classes at our top rated Bali yoga retreat. Val Poczwa Glenister began ballet at the tender age of four years, continued her studies under the Royal Academy of Dancing (RAD), eventually obtaining the highest qualification, the Solo Seal. After winning her first scholarship to the New Zealand Ballet School, Val won a further scholarship to the Royal Ballet School in London. She graduated and joined the Belgium Ballet Company and danced for a number of years professionally, throughout Europe. At the suggestion of legendary promotor Harry M Miller, Val moved to Australia and put together an Adagio Act and Dance Troupe, which toured Asia and Australia for five years. As a natural progression, Val has applied herself to Hatha, Ashtanga and Kriya Yoga. bringing the unique drive and determination, essential to an elite ballet dancer. With the professional understanding of movement and how the body functions, Val now imparts her knowledge to her many students. Over the past 35 years she has practiced yoga and pilates daily. Your therapist will begin with a traditional full body massage to deeply relax your whole body. Especially designed to pamper, stimulate and detoxify. Followed by a body scrub of your choice. Feel the ancient secret of Balinese herbal scrubs using your chosen blend of local herbs and authentic Balinese spices from our organic garden. These are combined with powdered rice and will remove the dead skin cells and promote circulation. This is an ancient Indian therapeutic technique combining a deep but gentle full body massage. The therapist incorporates both hands and feet with lgengar yoga stretching. Sesame oil and calamus powder detoxifies and exfoliates. The massage and yoga stretching will infuse your body with prana. Many ancient cultures have used the healing power of stones for medicinal and spiritual purposes. Balinese tradition believes that "batu" stones are filled with the vitality and energy of the water that flows over them in an eternal stream. Harnessing the properties of the volcanic basalt stone, we bath them in aromatherapy oils and warm water. The stones are then placed on the key energy centers of the body allowing the penetrating heat to relax and revitalize. This is then followed by a full body massage. This massage stimulates numerous nerve receptors, lymphatic drainage and toxin elimination. Other benefits include improved circulation and oxygen flow as well as collagen production. Acupressure techniques and gentle strokes help relieve stress, sinus congestion, migraines and headaches, bringing you increased calmness and overall wellbeing. Thai massage works on the meridian energy lines within the body. The therapist will use their body weight to release stress and tension from the muscles of the body. The Thai method uses pressure point muscle stretching and compression. This massage is performed with the client fully clothed and no oils are used. This mood lifting experience begins with a Balinese chocolate-almond scrub, followed by a decadent body mask of warm melted chocolate. The anti-oxidant and soothing properties of cacao and almond will leave your skin feeling velvety smooth and deeply nourished. For the final touch, revel in an invigorating cacao butter body massage. Papaya for normal skin, orange for oily skin, coffee for cellulite and stretch marks or avocado for dry skin. Using a blend of powerful local herbs, cinnamon and coffee, or a bend of sacred spices using turmeric, galangal and ginger. Enjoy our signature Footbath Ritual using our traditional Balinese scrubs to renew and refresh your feet. After meticulously grooming your nails and cuticles our special blend of coconut oils blended with local herbs and spices are used in a foot massage. Indulge yourself as your hands are bathed in warm flower infused spring water and exfoliated with a sea salt scrub. The nails and cuticles are groomed meticulously, followed by a special buffing leaving your nails with a natural healthy shine. Finally your hands and arms will be massaged with coconut oil combined with our unique mix of herbs and spices. Pamper yourself with a luxurious Balinese facial. Avocado has been used for thousands of years to heal and soothe the skin. This deeply hydrating facial incorporates an avocado mask combined with the natural probiotic properties of yoghurt to help repair sun damage and promote the growth of healthy skin cells. Following the mask a nourishing virgin coconut oil is used to massage your face and neck to ensure your skin is left smooth, vital and healthy looking. Ideal for dry and sensitive skins. Soak your worries away with a sublime bathing ritual. Water is the elixir of life and a divine healing renewing force. Enjoy an aromatic flower bath with lemongrass, Balinese orange, lime, pandan leaves and ginger. Energize with cinnamon, red hibiscus and flowers. Harmonise with coconut milk and heavenly frangipani flowers. Honour your body, mind and soul with Asian reflexology therapies. This style is known as Rwo Shur. This style is known as Rwo Shur and is a foot massage combined with acupressure that stimulates various organ and body functions.